Butchers & Catering — Friends Farm Shepherds Hut Holidays & Shepherds Hut makers. Based in Alburgh, South Norfolk, Friends Farm sell home produced pork and bacon and lamb direct from the farm and at local markets, as well as catering for events and parties. Find full details below, or contact us for more information or catering enquiries. 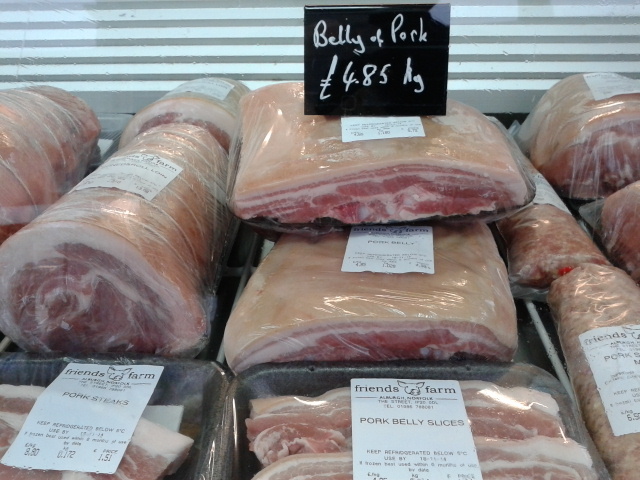 Friends Farm butchers shop sells our home produced pork, lamb, bacon, sausages and eggs, direct from the farm. All meat can be ordered in advance to be collected either from the farm or the markets we attend. Wholesale and trade enquiries welcome. Available to hire for weddings, parties and events, large or small. We provide a bespoke catering service using our home produced meats, from hog roasts to straightforward barbecues comprising of handmade sausages and burgers, pulled pork or lamb kebabs, served with salads, potatoes and a vegetarian option. Please contact us to discuss your requirements and make a booking. Find us at Harleston and Beccles Farmers Market s at the times below. Buy fresh meat from our chiller, or tuck in to our home produced sausages, burgers, bacon rolls fresh off the barbecue. Most of our pork comes from gilt (female) pigs that have the opportunity to run outside, explore their surroundings and root around in the mud. They are sent to a local abattoir before being returned to Friends Farm to be butchered in our on farm butchery. All of our sausages are made on site using at least 80% pork and other top quality ingredients.